All about me activities have never been so SUPER! This resource is perfect for the first week of school! These all about me activities and printables focus on getting to know each other activities, goal setting, and speaking and listening standards 1, 3, 4, 5, and 6. Don't miss this great beginning of the year activity. Your little superheroes won't even realize how hard they are working. This is a do not miss beginning of the year activity. Please be advised that all printers are different. These are adorable, but may require you to adjust your print settings depending on your printer. I have included two pages with pictures to help you with printing. Not feeling like conquering the tech? No problem! I have also printed these on paper, cut them out, and glued them on lunch bags. They turned out SUPER cute too. This resource is a perfectly paired with the following resources. 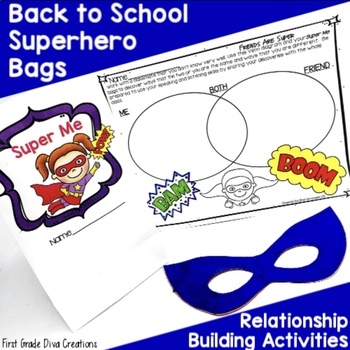 This great resource is included in The Ultimate Superhero Unit! *Please, click "Follow Me" at the top of my store. I will inform you of all new freebies!